UN Learning anything is a mighty task. 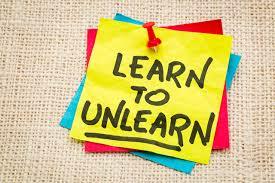 First, we need to accept what we’ve been taught, or examples shown, no longer fit with our current life. This does not make them inaccurate or less than, but purely a contradistinction. This applies to Career, Family, and most importantly, Love. When you expand in life, so should your views. When something life altering happens, so does your mindset. Reeducating yourself is crucial. Love, and the endless emotions it offers is something we are constantly, learning and unlearning. As a Divorcee, my views on love are similar, but definitely differ from when I was married. My challenge in 2019 was to not only gain stronger perspectives of what Love means to me, but also choose different mental models to mold my view on it moving forward. Being a hopeless romantic is a frequently used term, that hasn’t been revisited in a while. What does being a hopeless romantic mean in 2019? These are things we have to constantly ask and pray for clarity on. Advocating for love is great, advocating for healthy, reciprocated love is another story. Our Parents and even their Parents views on love varied. They all took chances, risked their own integrity behind inherited views and opinions. We must slowly un learn the tolerance they endured, the pride they maintained, and the unwritten rules we’ve obtained over the years. 2. Be authentic and courageous with your choices. 3. Be who you want to be loved by. 4. Challenge (Not Change) your standards. My view on this is compared to a child playing with blocks. At first observation, a child will clear an area and proceed to create their masterpiece. Once all of their blocks are compiled and complete, they strategically dismantle those blocks to begin their next masterpiece. The one constant; they will always clear an area before starting again. Clean your pallet. Work hard at leaving the fictions intuitions, the UN birthed battles, and hereditary behaviors alone. Make sure you constantly are cleaning your pallet. We will always value our experiences, but can never make room for new ones if we are focused on our overall “Learned” thoughts. Be hungry and thirsty for the real time education on Love and all that entails.